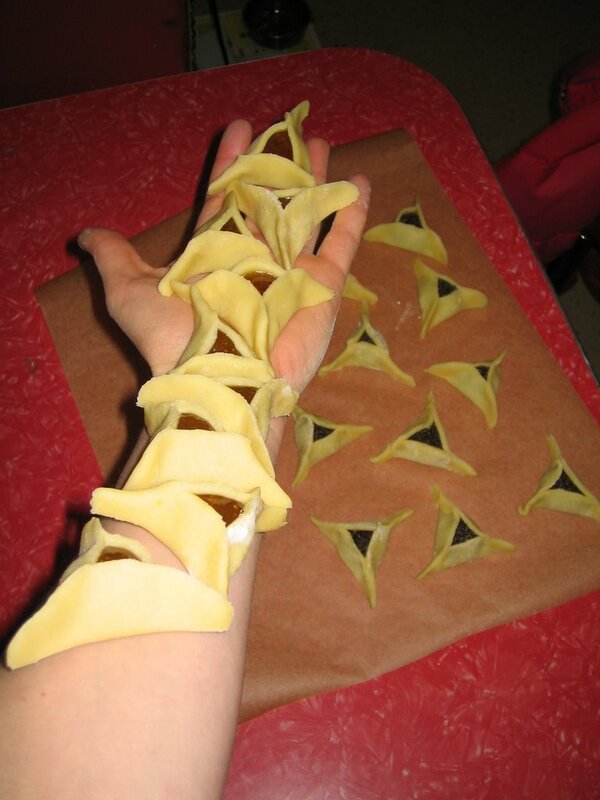 passover's over (last night, at a potluck, i gorged myself on tortilla chips fried in lard). but i just got some lovely photos from my lovely photographer friend. 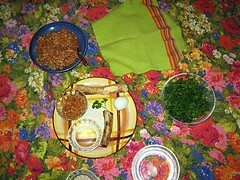 pictured is the seder plate with assorted extras. that green blob is the matzah. i got my roasted lamb bone from Long's, the butcher shop in town. a fantastic place with high quality meats. and certainly a store that is more accustomed to providing their customers with meat, not bones. luckily, i thought to check the paper-wrapped bone before leaving Long's. they had given me an entire bone, measuring about a foot long! all gross and bloody, too. bleh! i thought not of the oppression of the Jews in Egypt but of Fred Flinstone. it wasn't good. they were nice enough to lop off the ends of the bone, leaving me with a more reasonable lamb bone, measuring perhaps three inches. whew! as for the rest of the passover adventure, you should check out the photos. my friends were all well-behaved. not even a fight over the afikomen. and the youngest literate member of the seder party (age 25) did a wonderful job with the four questions. next year, i'll have to teach her to do them in hebrew. My Personal Professional Photographer (3P) is doing a series on austere lunches and this passover lunch seems to fit the bill. 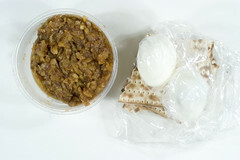 a container of leftover sephardic charoset (like an unformed powerbar with nuts, dates, honey and apples), two hard boiled eggs and matzah. i also finally, last night, delved into the world of the matzah pizza. i've vowed to avoid matzah lasagna (hate the stuff!) this year, but i love of the matzah pizza. the only difference between the two is that the lasagna allows for the matzah to absord every drop of moisture from the sauce, where the pizza is made and eaten instantly, and thus retains some moisture. 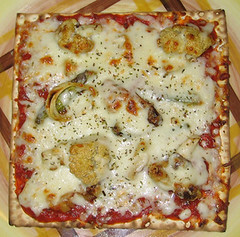 last night, i went upscale with my matzah pizza, using leftover roasted veggies to dress it up a bit. i'd never put toppings on my matzah pizza before and, you know, it makes a big difference. shocking, i know. this pizza had cauliflower, leeks and green onions on it. pretty fancy, eh? i also, for the first time, cut the pizza into pieces, rather than biting into the whole thing, which inevitably breaks the matzah into a zillion pieces and sending them cascading down the front of my shirt, leaving a trail of crumbs and tomato sauce. is totally beyond me. i guess i'm usually just thinking to much about the oppression of the Jews in Egypt when we were slaves. report to follow, pending arrival of photos from my own personal professional photographer...and really, you should try to find one for yourself--they're quite nice to have around. and the shoelaces?, you ask. its all part of a top secret jewish ritual that i can't reveal to the unlearned masses. or maybe it's just that the laces on my brand new swank shoes broke. drat! deeply offend any vegetarians who read this. possibly turn some carnivores into vegetarians. 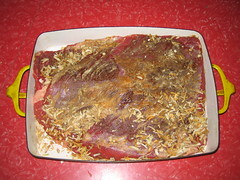 get me disowned because, for those who are sharp enough to differentiate powdered foodstuffs, it reveals the first step of the famous top secret brisket recipe, passed in a elaborate top secret ceremony from jewish woman to jewish woman over decades. but i had a vaguely traumatic experience obtaining the meat, so i'll document it graphically and textually if i want, dangnabbit! it wasn't that traumatic, really. mostly, i realized at 5:30pm, as I was about to go workout at the gym, that i'd forgotten to pick up the brisket for tomorrow's seder!! and since it must sit overnight in a marinade of [top secret ingredient redacted], i had to get it TONIGHT. and the butcher shop closed at 6pm! oh no! so, rather than exercising in order to ensure a long and healthy life, i hopped on my bike and zipped off. i abandoned Brisket Plan A (which i had forgotten entirely until it was too late to implement): retrieving my car from my house to drive the fairly long distance to and from the butcher shop. instead, i devised and implemented Brisket Plan B. i schlepped to the butcher shop on my one-speed bike, purchased and packed the five pound piece of raw meat in my backpack and biked home. distance of about 4 miles. ok, that's not so far, but it could have started to rain at any second! and i had to stop on the way home to get [top secret ingredient redacted]. and an apple. it was serious. thankfully, i made it home in time to reheat the matzah ball soup before my guests arrived to eat passover leftovers and work on tomorrow's haggadah. wow, what a life. i really am feeling the suffering and oppression of my ancestors. happy new year! eat matzah! i hit the grocery stores today, so as to not have a repeat of previous years. buy your matzah (and related products) early and often. that's what i always say. i realize that i do not live in chicago, new york or philly. there may not be enough jews here for a minyan. but people, if you are going to set up your little holiday kosher section, make sure you've got the right holiday! i know, i know, all those funny sounding words can be confusing, and, geez, we do use both the hebrew and english holiday names at random, which makes it even harder to follow what's going on. plus, well, given that all jewish holidays center around consumption of massive quantities of food, an outsider may see no major difference between, say, passover and rosh hashanah. brisket is brisket, eh? but, on the other hand, passover packaging is wallpapered with the word...it's gotta be hard to miss. also, rosh hashanah and passover are six months apart. and rosh hashanah means a run on apples and honey, not an entire shift in the, er, dietary paradigm, if you will. 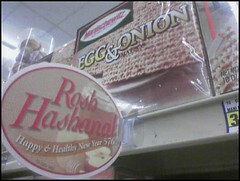 my local massive chain grocery store missed these rather broad clues and chose to celebrate rosh hashanah in april with boxes of egg&onion matzah. i could've should've said something, but i decided that it would be better to provide the local jews with a little laugh instead. so, my lips remained sealed. 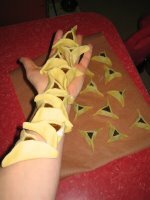 so last week, as i was launching into hamantaschen round two, i decided that i needed The Best Equipment for the job--i wasn't going to mess this up. the recipe required that i make the dough in a food processor and so i took myself and my 20% off coupon to Bed, Bath and Beyond and got myself a real live grown-up cuisinart (7 cup bowl). it's the basic model: settings are on, off and pulse. but it did come with a video tape that presumably instructs on how to move between these settings...i haven't watched it yet, so i'm not sure. but isn't it beautiful! what it lacks in settings, it makes up for in the variety of blades, shredders and whatnot. and, frankly, i'm off the opinion that "on" and "pulse" are all you need. my dough and my hamentaschen turned out perfectly!here they are, about to go in the oven. i made about 7 million of them...even running out of jam! thankfully, my neighbor and i have a beautiful relationship in which she provides me with missing ingredients and i provide her with fresh-baked goods. i found, by the way, that the cheapo albertsons brand jelly was much easier to work with than the farmers market homemade, organic stuff. all the chemical junk they put in the storebought really keeps the jelly together when its heated to 325 degrees, whereas the higher quality product just melts into a big runny mess. 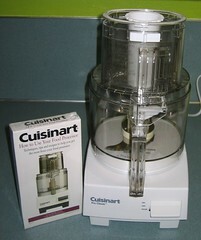 i love my cuisinart. it is definitely my favorite new toy. and it makes me feel like such an adult.